Curious, active and widespread across the upper US and Canada; often seen at feeders. Found in most habitats with trees: forests, fields, parks and backyards. Social and often attracts other species to mixed flocks. Very small; large-headed, with a black cap and bib, gray back, and white cheeks and belly. 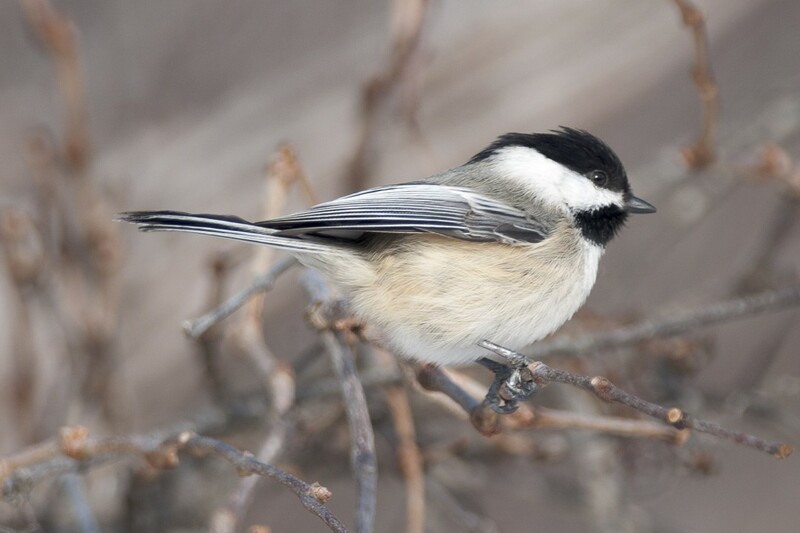 Many species respond to chickadee alarms calls, and the longer the alarm the more significant the danger. Eats seeds, berries and insects, and can hide thousands of food items, each in a different location. Excavates or uses existing cavities (including nest boxes) for nesting, often in birch and alder trees. Lifespan up to 12 years. Population ~ 41 million and stable.